"You have a very loose tongue, friend. I'll fix that." It's not entirely clear why this film has the title it does; a far more appropriate title would have been Cesare Borgia since the film centers almost entirely on his various schemes and crimes, which only incidentally have an impact on his sister Lucrezia. Compared to Cesare, the infamous Lucrezia is a comparative innocent in all of this. 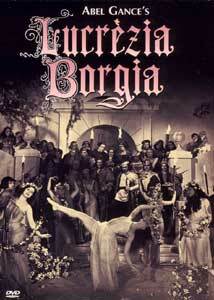 Perhaps the creators felt Lucrezia had a much higher name recognition factor. In any event, as the film opens in late 15th century Rome, Rodrigo Borgia (Roger Karl)—father of Cesare (Gabriele Gabrio), Lucrezia (Edwige Feuillire) and Jean, the Duc du Gandie (Maurice Esconde)—has been appointed Pope Alexander VI. Cesare, under the influence of his advisor, Nicolo Machiavelli (Aime Chariond), sees the possibilities in this familial connection and begins scheming as to how he will obtain and consolidate power. These schemes include using sister Lucrezia as a pawn by setting her up in a series of marriages and then eliminating her husbands in one way or another in order to move her up the next step of the ladder. Cesare will let nothing, including his brother Jean, stand in his way, and before long he has much of Italy completely cowed. However, a renegade priest, Fra Savonarola, (Artaud) begins sermonizing against the evil that the papacy is taking part in and soon has the mob at the doors of the pope's palace. Director Abel Gance is best known for his 1927 epic Napoleon. Here, he takes the theme of the Borgias' climb to power and their consolidation and runs with it. The climactic bacchanal feast held by Cesare epitomizes their contempt for the public and any kind of morality whatsoever. Few cinematic episodes of its like can compare to it, as it degenerates into a chaotic brawl of lust and feeding. The assaults on the serving wenches are downright harrowing and the equal in brutality of any modern film. Quieter moments have their power too; the sight of the pope threatening a prisoner with torture underneath a massive crucifix is vivid and unforgettable. Machiavelli's part cannot be overemphasized, for typically it is he who maneuvers the bestial Cesare into a particular path, and once Cesare has begun down it, the advisor hovers over his shoulder like a leering vulture. The animated titles, which dissolve into a pool of black blood have undeniable power as well; such titles were eventually to become a cliche` in the 1960's, but this is surely the first use of such a title sequence and must have made an enormous impact when new. Gance uses a moving camera to great effect in this film. During the mob sequences we feel as if we are in the midst of the crowd as it surges forward. Lighting also plays an enormous part, often in irony, such as in the scene before the crucifix noted above, where the pope is bathed in light. Overall, a stylish and quite effective story of power and nepotism taken to the nth degree. Image Transfer Review: The print used has a fair amount of damage; scratches, splices, blobs are visible and there is frequent speckling throughout. However, the picture is a good deal better than that on the Gance Beethoven disc reviewed elsewhere on this site. Blacks are deep, and the film is printed in a fairly low contrast. There are an enormous range of greys visible, and the picture is generally crisp and clear. There seems to be some cropping at the top; in several scenes the top of Cesare's head above the cheeks disappears off the screen. This print could have used restoration, but it's not unwatchable. Audio Transfer Review: Unfortunately the audio doesn't fare quite as well. The sound is weak, thin and tends to have a warbly quality to it. There is a significant amount of noise, and in portions of the film the dialogue is distorted by buzzing. The volume levels are set extremely low. Overall, not a very satisfactory sound at all; this really should have been cleaned up. Extras Review: Although the chaptering is inadequate, the subtitles are thoughtfully provided in a contrasting yellow, and they are removable so that the lower portion of the picture can be seen in full. The primary extras are two short silent films (two- and one-reel respectively) also by Abel Gance. The first is Au Secours! (Help! ), a 1923 tale about Max (Max Linder), who takes a bet that he can spend an hour in a supposedly haunted castle. Before long apparitions and all manner of strange occurences afflict Max, many through optical distortions. At first quite humorous, before long this film becomes truly terrifying. The transition is seamless and highly effective. The second extra is an experimental avant-garde film, La Folie du Dr. Tube (The Madness of Dr. Tube). This short features a doctor (Albert Dieudonne, in the character of a pinheaded Marty Feldman prototype) who has developed a sneezing powder which, when inhaled, causes the world around one to become highly distorted, an effect obtained through shooting with funhouse mirrors. He tries it out on two young women, and then two young men, and the resulting distortions are displayed, much to the doctor's amusement. No doubt influenced by the French Dadaists working at the time, this short is quite bizarre and inventive. Neither short has a music score of any kind, which is quite inappropriate. The films are both run at sound speed, which causes the action to appear significantly sped up, though not overwhelmingly, especially in the case of Dr. Tube. Neither short is in very good condition, but Dr. Tube is clearly the inferior print. Both are acceptable for their age, but neither is comparable in condition to the main feature. A vivid and unforgettable look at the cruel Borgia family and their activities; it doesn't pull punches however, and should not be viewed by children or the sensitive. It's too bad the picture and audio of the source material weren't in better shape, but the main feature is highly interesting and the supporting shorts both have their merits.